Do you choose quality or affordability? With us, you won’t sacrifice either. Oklahoma’s best source for your remodeling needs! We have the largest selection of backsplash material, porcelain tile, ceramic tile, granite and natural stone in Oklahoma. We also stock full body shower panels, and tempered glass shower doors with kinetic rollers for your shower needs. Not to mention 5 lines of unfinished cabinets in-stock, and finished vanities. Our experienced staff can render a computer generated layout and are ready to help you with your home needs! All at an affordable price, so you can have the home you deserve. We have over 19,000 cabinets in stock. We offer unfinished cabinets at both kitchen and vanity depths. We also offer select finished vanity cabinets. Want finished cabinets for your kitchen or more color options? Visit our sister location next door, Cabinet Outlet, for more choices. Not sure which combination of cabinets you need? Visit our store’s Layout Station and we’ll help you design what you need. 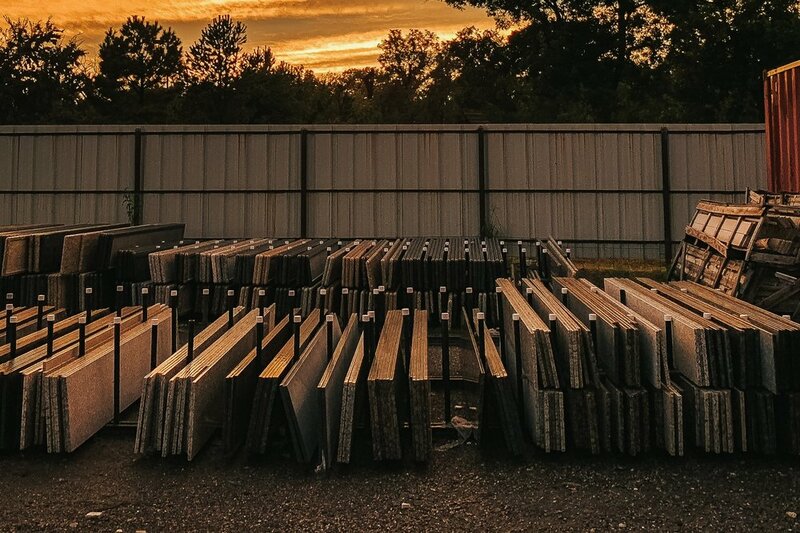 Choose from a wide variety of granite, quartz, cultured marble, and laminate countertops. We can cut and install it for you, or you can take home a Cash & Carry slab yourself. Visit our countertops page to see prices. In addition to our cabinets and countertops, we stock modern kitchen sinks and faucets to fit your needs and taste. Whether you need toilets, bathtubs, showers, shower pans, faucets, or sinks, you can trust that we supply elegant and affordable fixtures, that will complete your bathroom. When it comes to tile and flooring, it can seem like you never find what you want. We understand and have you covered. We stock vast amounts of color, material, and design options to fit your specific situation. In our store, you’ll find backsplash, porcelain tile, ceramic tile, travertine, natural stone, and luxury vinyl tile. We offer so much we can only display a limited amount of our inventory on our site. So, visit our store today to see more! Our doors provide a modern, rustic look to your home. We carry both slabs and prehung doors as well as glass panel doors. Additionally, you can find barn door hardware to create stylish sliding doors that are both functional and fashionable. We’ll even route your doors if requested! Missing a little something? Here you’ll find a gallery of miscellaneous items that could be what you’re looking for. If you need help designing your new kitchen, or would like to see how to reconcile your design with what we have to offer, then visit our Layout Station near the front desk and one of our sales associates will assist you. There we will create a digital layout of your kitchen, testing out different cabinet size configurations, and can even show you a 3D rendering of what it will look like! Then they can easily price out the total cost of your kitchen depending on which cabinet style you prefer.